Toyota UK has announced that its new Prius III will cost from £18,370 for the T3 model, £19,990 for the T4 and £21,210 for the range-topping T-Spirit. While there is more standard equipment than on the current model, the price of the T3 and T Spirit models stays the same, while the mid-spec T4 has risen by £835. Entry-level T3 gains head-up display, 'touch tracer' multi-function buttons mounted on steering wheel w/ 6 speaker audio system with CD stereo, smart entry & start, 15 inch alloy wheels, climate control, Vehicle Stability Control (VSC) w/ Traction Control, front & rear electric windows, 7 airbags (x2 front, side and curtain including driver's knee airbag), heated door mirrors and fog lamps. The T4 benefits from the addition of 17 inch alloy wheels, cruise control, leather steering wheel with 8 speaker audio system & Bluetooth, rain-sensing wipers and smart entry and start. Flagship T-Spirit now features a HDD (hard disk drive) navigation system and music library and an improved intelligent park assist with rear parking camera. Option packs and accessories will be offered, alongside metallic and mica paint. T-Spirit models have the option of a solar panel mounted on the roof of the car to power the cabin ventilation. Toyota says its Hybrid Synergy Drive now delivers 24% more power, yet the unit is more compact and lighter than before, making the Prius faster. Prius is also more spacious than its predecessor, with more rear head and legroom. The boot is also larger thanks to the smaller hybrid battery unit. CO2 emissions have been cut to 89g/km from 104g/km and fuel consumption has improved by 10% to 72.4mpg from 65mpg. 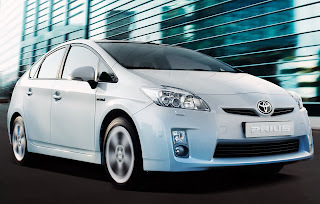 The new Prius III will arrive in UK showrooms from the 27th July to the 4th August. Sounds good. My 07 Prius T3 gets 60mpg at 60mph: 10% better mpg is good. Glad about the heated mirrors and the only thing I want to be certain about is a temporary spare. The Insight has a "kit" which rules it out for me. I gather the 17in wheels reduce mpg and the "sunroof" rules out a temporary spare. Strange. Well the 17" wheels according to Toyota sohludn't hurt fuel economy but in the real world, it will.